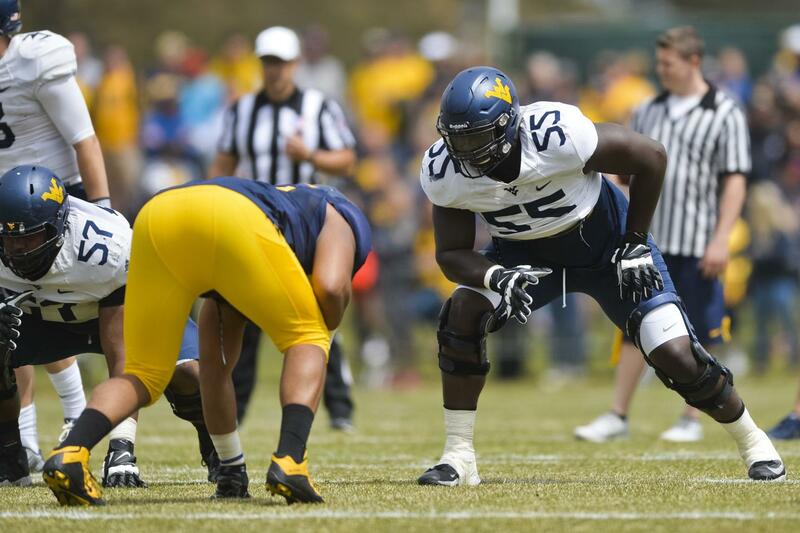 Former WVU offensive lineman Yodny Cajuste was among the standouts in the offensive linemen group Thursday at the NFL Combine in Indianapolis. Cajuste’s official measurements fall in line with what NFL teams have been looking for from linemen in recent years. He checked in at 6-foot-4 and 7/8ths and 312 pounds. Cajuste has a wingspan of 82 1/4 inches, his arms are 34 inches long and his hands measured 10 inches. Lineman were among the first players to get a crack at the bench press this week, and Cajuste put on a show. The always busy folks from WVU’s video production department were there with cameras, duh. Cajuste’s 32 reps — more than any WVU player has ever done at the Combine — placed him fourth among this year’s group of offensive linemen. Weber State’s Iosua Opeta led the group with 39 reps, followed by North Carolina State’s Garrett Bradbudy (34) and Wake Forest’s Phil Haynes (33). The rest of WVU’s contingent in Indy gets rolling in the coming days. Quarterbacks, receivers and tight ends — which includes Will Grier, David Sills, Gary Jennings and Trevon Wesco from the Mountaineers — are scheduled to do the bench press Friday with an on-field workout on Saturday. Linebackers — which include WVU’s David Long — are on the bench Saturday then workout on the field Sunday. One last football post here today before we shift our focus to tonight’s basketball game in Morgantown against visiting Kansas State. As mentioned in my earlier post, new WVU football coach Neal Brown introduced his first Mountaineer staff to the media this morning at Milan Puskar Stadium and we learned more about who will coach what positions and who will recruit what areas. I was in the process of typing up something very similar for this post, then a handy breakdown of each new West Virginia assistant was sent out by the folks in WVU’s sports information department. I’ll post that below (minus a bunch of quotes, several of which I’m hanging on to for stuff I’m working on). Keep an eye out in the next few days for more stories coming out of today’s meeting with the new football coaching staff.